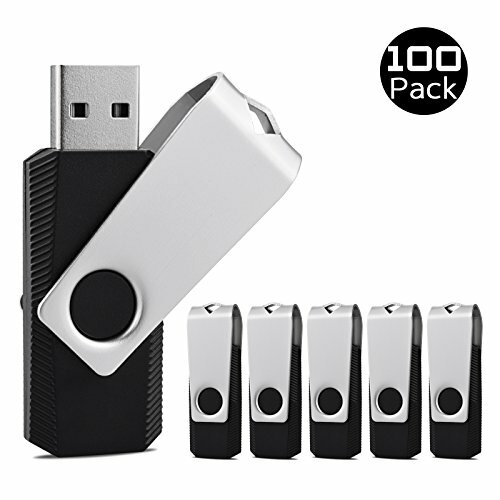 INCREDIBLE STORAGE -100 * 1GB USB Flash Drives, without any logo on it, you can print yours or customer's personal logo on it. Great for business use: digital data storing, transferring and sharing to clients. Apply to data storage of music, photos, movies, designs, manuals, programmes, handouts etc. SLEEK, CHIC, CONVINIENT AND ALSO USEFUL - The lightweight and portable usb sticks have a nice and sleek design with a metal swivel cover on each memory stick. The aluminum swivel is very smooth - making the flash drives look stylish and chic! They have a tiny LED inside which is solid red when connected and flashes when it's being written to. The end of the thumb drives has a loop for a lanyard or key ring to keep it safe or on your keys.